Available for Fall 2012 classes. University Physics for the Physical and Life Sciences teaches the fundamentals of introductory physics, while weaving in formative physiology, biomedical, and life science topics to help students connect physics to living systems. The authors help life science and pre-med students develop a deeper appreciation for why physics is important to their future work and daily lives. 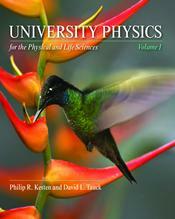 With its thorough coverage of concepts and problem-solving strategies, University Physics for the Physical and Life Sciences can also be used as a novel approach to teaching physics to engineers and scientists or for a more rigorous approach to teaching the college physics (algebra-based) course. For more information about Volume 2, click here.